Father of Indian National Mohandas Karamchand Gandhi, popularly known as Mahatma Gandhi, led the nation through the Indian freedom struggle with his ideologies of ‘Ahimsa’ or ‘non-violence’, ‘Civil Disobedience Movement’ and ‘Swaraj’. Mahatma Gandhi's principles believed in truth and non-violence as the key point to lead a moral and peaceful life. Gandhi always believed in simple living and high thinking. For him, service to mankind is service to God. One can know about his ideas through his writings, especially in his autobiography, ‘My Experiments With Truth’. He had written several books and articles, which are mainly in Gujarati language. He was the leader of Indian National Congress and initiated Satyagraha movement. He was honored the title ‘Mahatma’, meaning ‘great soul’ by Rabindranath Tagore. Mahatma Gandhi is known as Father of Nation and played a key role in the Indian freedom struggle. Mahatma Gandhi main contribution lay the fact that he bridge the Gulf between intelligentsia and the masses and widened the concept of ‘Swaraj’ to include almost every aspects of social and moral regeneration. Paying tribute to Mahatma Gandhi on his death, famous scientist Albert Einstein said, “Generations to come will scarce believe that such a man as this walked the earth in flesh and blood”. Mohandas Karamchand Gandhi was born on 2nd October, 1869, in Porbandar, India, in Hindu family. Since his childhood he displayed all his great qualities, which he had inherited from his mother. At the age of 13 he married Kasturba Makhanji and had four sons. He pursued a degree in law from the University of London. However, Gandhi failed to manage law practice properly in India. And thus went to South Africa with one year contract job offer from Dada Abdullah and Company. During Mohandas Karamchand Gandhi is one year of job in South Africa, he had not only come to know about the racism, but also been treated badly. Indians were discriminated from the citizenship of South Africa. Gandhi fought for equal justice and founded and Organisation as Natal Indian Congress. There, initially he used ‘Satyagraha’ and ‘nonviolence’ as his ultimate weapon. But finally, after punishment and imprisonments, Gandhi made South African government compromise, peacefully. After returning from South Africa (9 jan 1915), Mohandas Karamchand Gandhi settled in Ahmedabad near Sabarmati river. 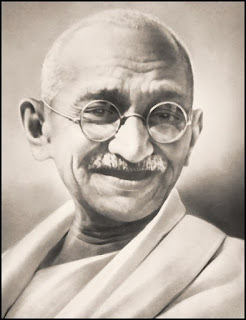 Gandhi took active participation in the activities of Indian National Congress and launched ‘Non-cooperation movement’ and ‘Civil Disobedience’ campaign against the British. Gandhi focus himself in reforming villages, as he believed that rural India needed most of his support. Gandhi was shot and killed by Nathuram Godse on 30th January 1948, while he was going to approach a prayer meeting. Nathuram Godse blamed Gandhi for the partition of India. in 1996, the Government of India introduced the Mahatma Gandhi series of currency note in rupees 5, 10, 20 50, 100, 500 and 1000 denomination. today all the currency notes in circulation in India contain a portrait of Mahatma Gandhi. In the United Kingdom, There are several prominent statue of Gandhi Remembrance Day.